This exhibit commemorates the White Rose student anti-Nazi movement of 1942-43 in Munich, Bavaria. Contact Dr. Carol Leibiger at: c.leibiger@usd.edu or 605-677-6089. In 1942 and 1943, students at the University of Munich (Bavaria, Germany) led an underground campaign calling for the German people to actively resist the policies, actions, and especially the acts of aggression of the Nazi government. Under the name of “The White Rose,” group members created mimeographed leaflets, leaving them in public spaces and mailing copies to German citizens whom they felt might respond to their message of peaceful resistance. At night, the students painted slogans against the Nazi regime in a graffiti campaign around the city. Eventually the movement expanded to other German cities, including Hamburg, Berlin, and Vienna. 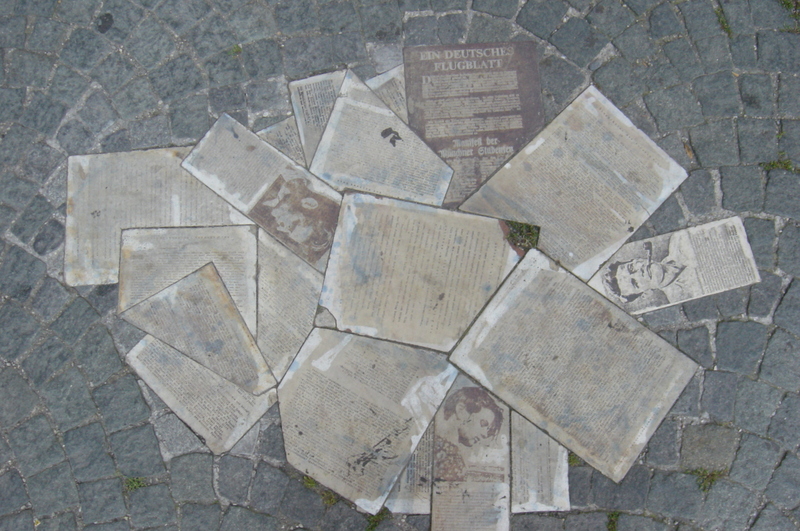 On Feb. 18, 1943, White Rose members Hans and Sophie Scholl were arrested by the Gestapo after distributing the leaflets in the University of Munich Atrium. Along with another member, Christoph Probst, a married father of three children, the Scholls were tried, condemned to death, and executed by guillotine on Feb. 22. Many White Rose members stood trial and faced execution or imprisonment in the months to follow. The last leaflet of the White Rose was smuggled out of Germany and ultimately air-dropped in large quantities over the country by Allied Forces. Now more than 70 years later, the White Rose is one of the most widely known resistance groups in German history. It has been the subject of several books and films. The White Rose Exhibit commemorates the bravery and integrity of a group of students in the face of political evil and popular indifference. The White Rose Exhibit is being hosted by the University Libraries (second floor) and the Neuharth Center (consourse). Two films about the White Rose will be shown in support of the exhibit. Following the films, German and Library faculty will facilitate discussions about the films and the White Rose. The exhibit is presented by White Rose Foundation e. V. of Munich, Germany.